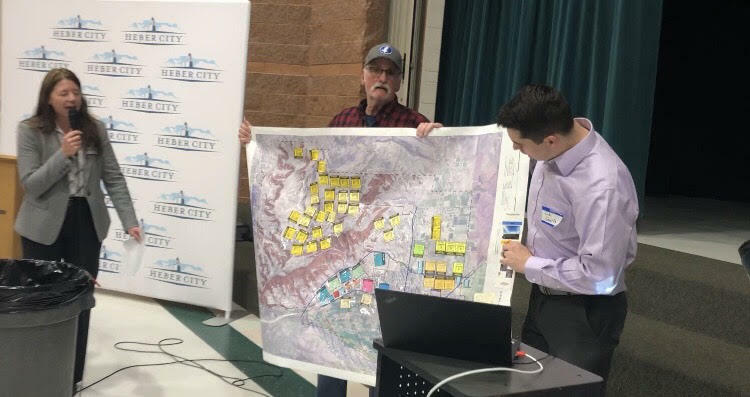 The event was the first of three public input meetings for the update to Heber City’s general plan. The evening was led by a consultant for the project Christie Oostema she explained why the city is seeking public engagement in the visioning process. Those in attendance participated in a survey on their smartphones. The survey asked questions about the future of Heber such as, what do you want to preserve or enhance? What would you like to see less of? And How Can Heber stay a great place and accommodate growth? You can take the survey here. Oostema also noted that the general plan process will be impacted by and have impact on two other planning efforts. After the presentation and survey the workshop portion of the evening began. Those in attendance were assigned to random groups with a map of Heber City covering each group’s table. At each table were small squares representing to-scale zoning possibilities. Residents were tasked to place these zones in areas around the valley to accommodate the projected growth. Projections by the state estimate Heber will double in size by 2050 to 30,000. “The challenge then is to use those chips to place 12,900 households, and the same number of jobs onto your map, in a pattern that you think makes the most sense,” Oostema said. Participants also marked what areas should be preserved as open space and where potential roads and trails could go. After about a half-hour of working tables presented their plan for the Heber Valley. The groups came up with a variety of options including making downtown Heber a densely populated district, preserving the north fields, and building along the East side of U.S. 40 north of town. Other options included creating more spread out neighborhoods even farther east of town, creating jobs south of town near the airport, and building out south of the Jordanelle. In all 20 maps were presented all independently made by members of the community, some with similarities and others more unique. The maps were collected by the city and will be used to inform the rest of the general plan update led by the 15-member steering committee. The slides presented at the meeting as well as the survey can be found here.